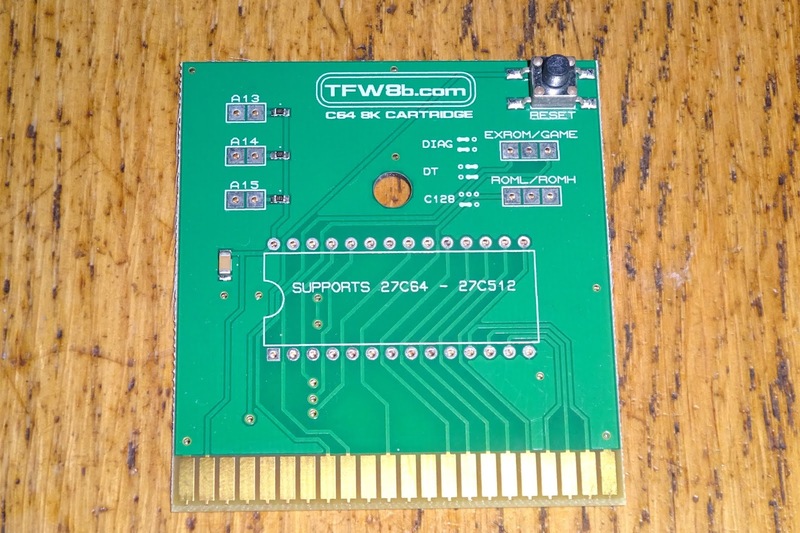 We have updated the design of the 8K cartridge PCBs for the C64 and C128 again. 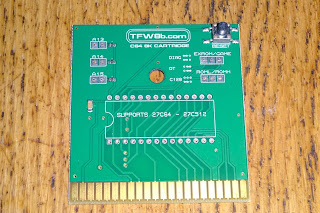 Now with extra shinny gold plated edge connector. 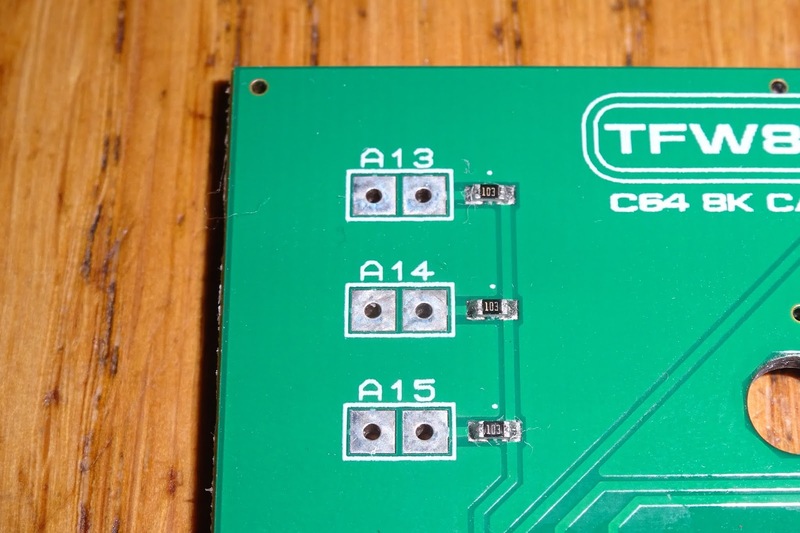 The new version comes pre-assembled with surface mount reset switch, decoupling capacitor and pullup resistors preinstalled. 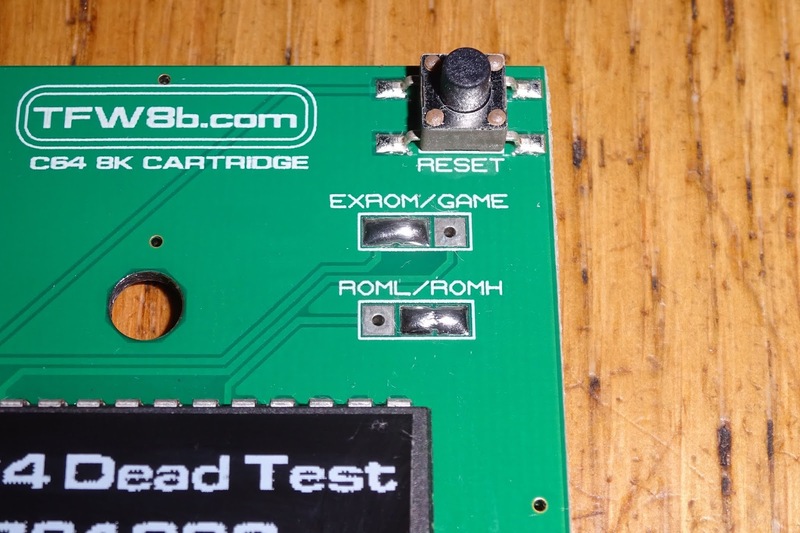 All you need to do is solder in a ROM chip and set the cartridge type. 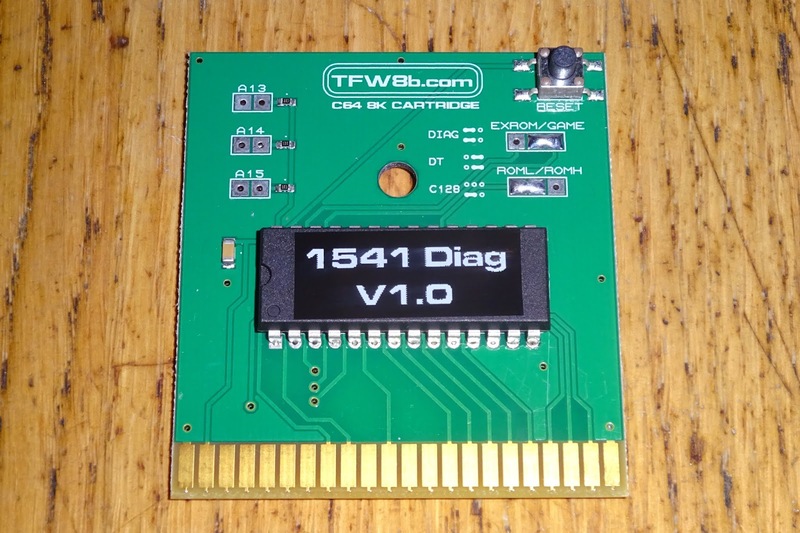 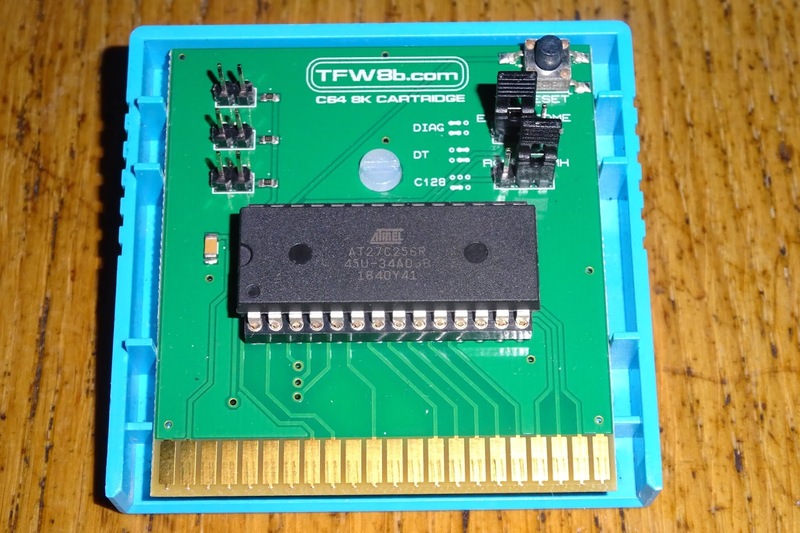 The boards are smaller than traditional cartridges, and will fit in an original Commodore cartridge case, but are designed to fit into the TFW8b cartridges cases. 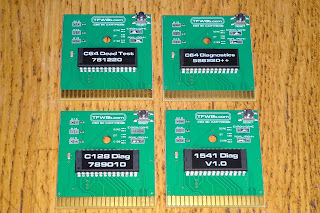 Many Commodore boards were only 3/4 length as well. 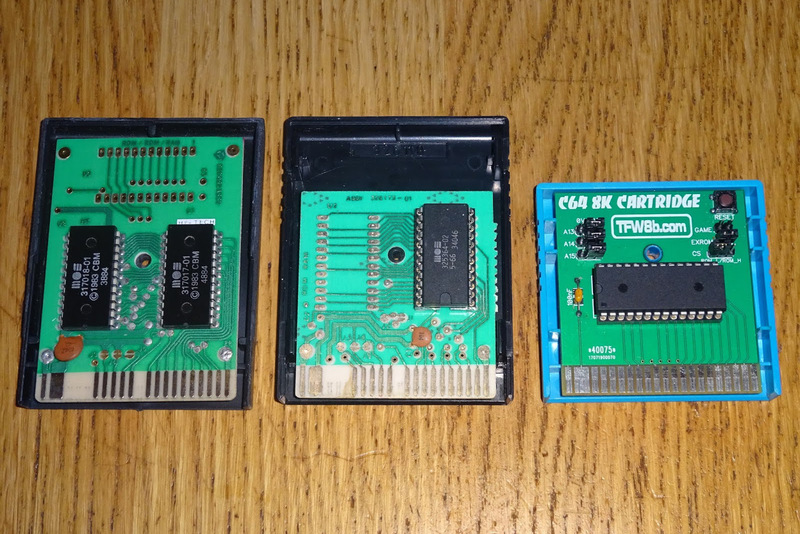 This is an earlier version of the PCB, but you can see the various sizes. 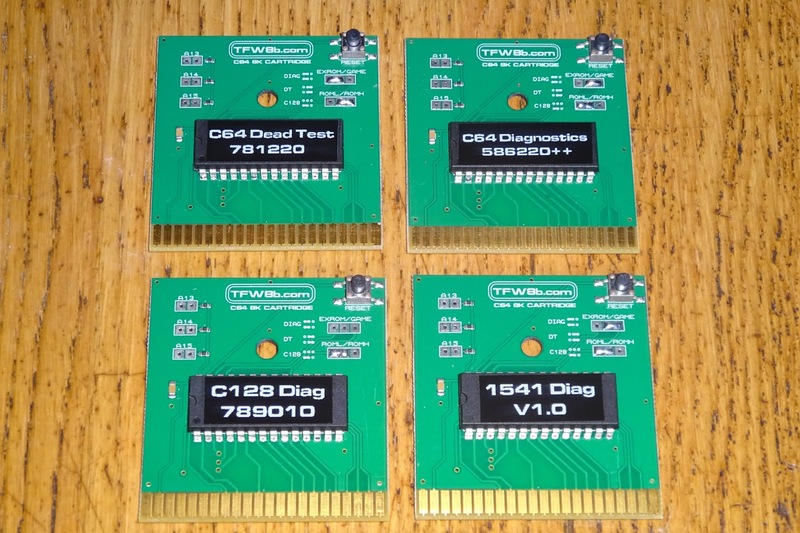 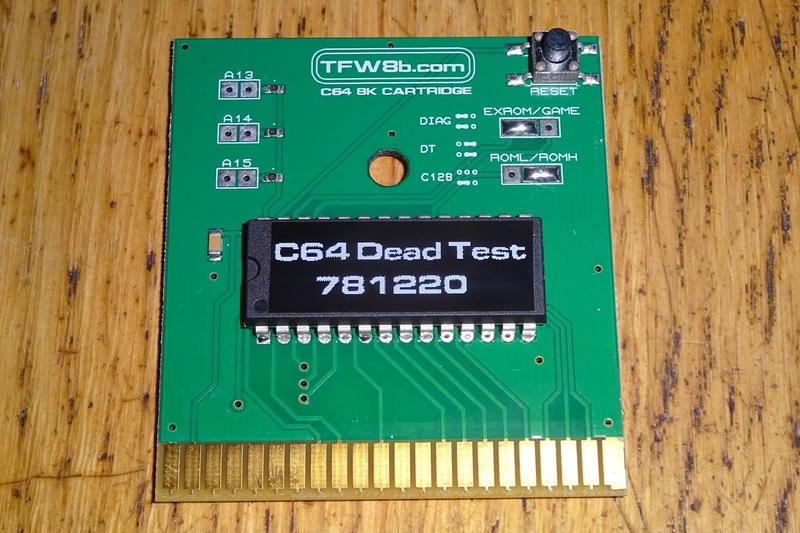 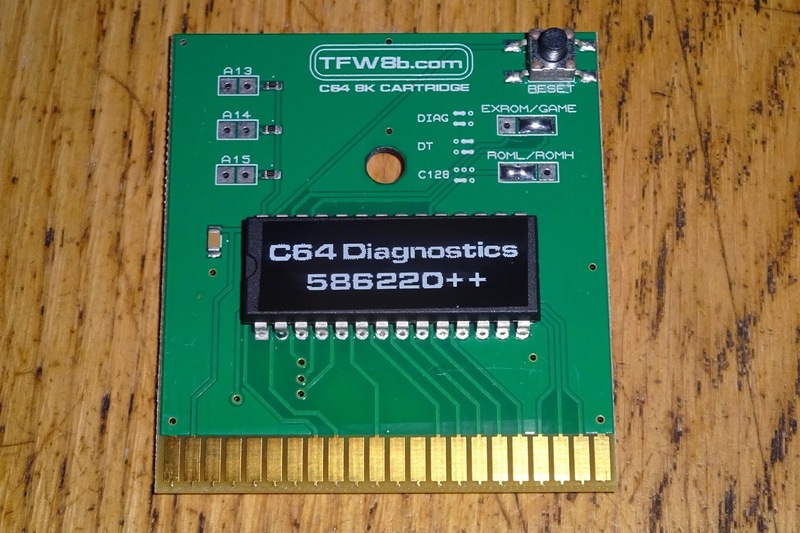 These new boards can be used to make various cartridges for the C64 and C128, including the Dead Test and Diagnostics cartridges, UltiMax and normal style game and utility cartridges. 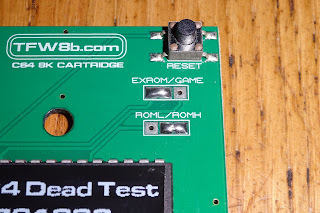 As pullup resistors have been installed on the spare address lines on the ROM chip, you no longer need to set the address jumpers, unless you want to change the location of the 8K ROM within the EPROM. 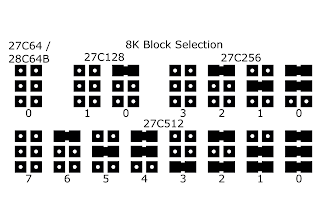 The board supports EPROM and EEPROM chips from a 27C64 or 28C64B up to a 27C512, which can contain between 1 and 8 of these 8K ROM images. 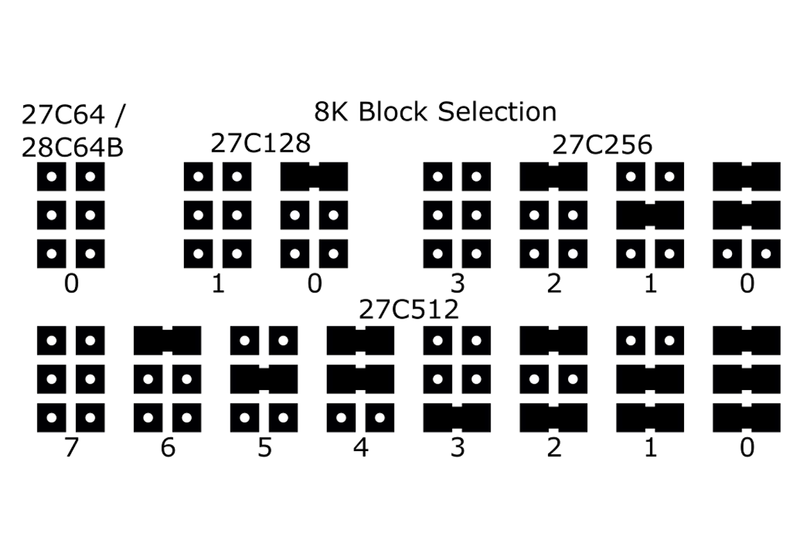 By default the highest 8K block in the ROM is selected. 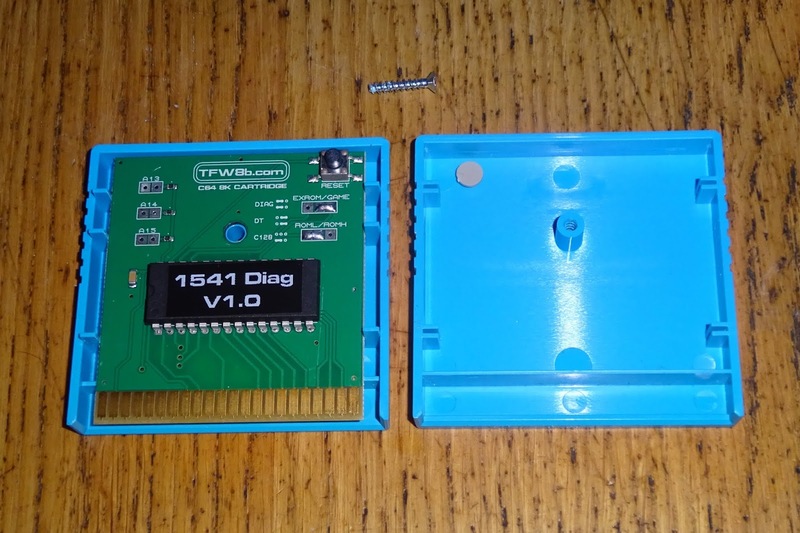 If you want to change this, either use solder blobs as above, or you could wire in a switch to make a multi-ROM cartridge. 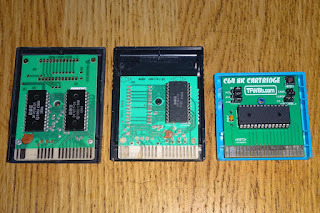 Here are some examples, showing the way the links would be set. 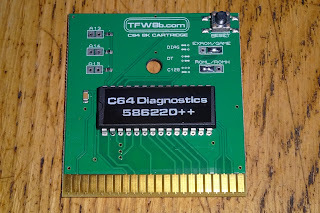 Firstly, the C64 Diagnostics cartridge. 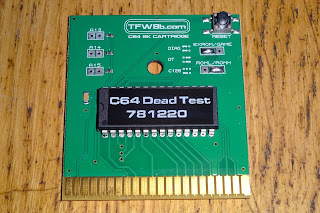 The Dead Test cartridge runs in UltiMax mode. Commdore 128 Cartridges don't set EXROM or GAME. 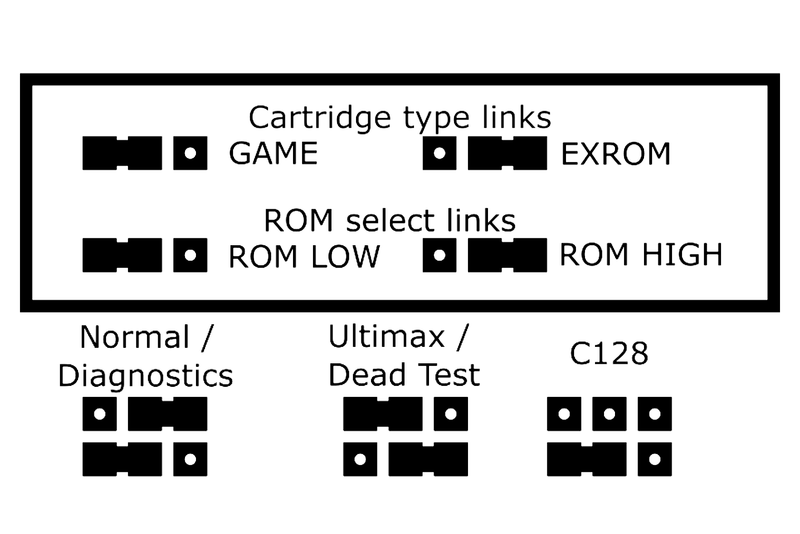 Most normal cartridges use the same setting as the C64 Diagnostics. 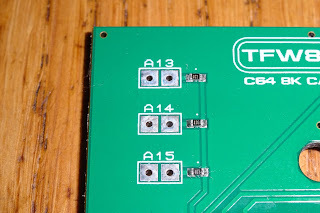 You can use the boards without a case, if you are sensible about static (i.e. 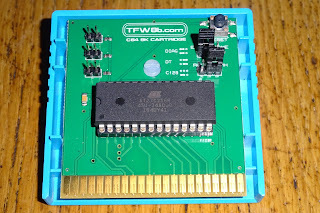 you are not working on a carpet), but you are best to put them in the case. 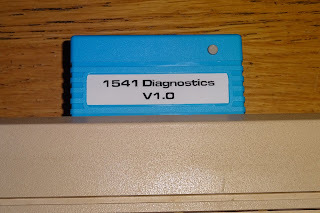 The newly manufactured injection moulded cases are shorter than the standard cartridge case, but the label and reset button are still visible when inserted into your computer. 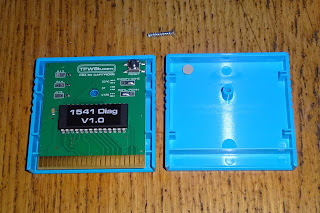 Due to the height inside a C64 cartridge case, you can't really fit a normal IC socket. 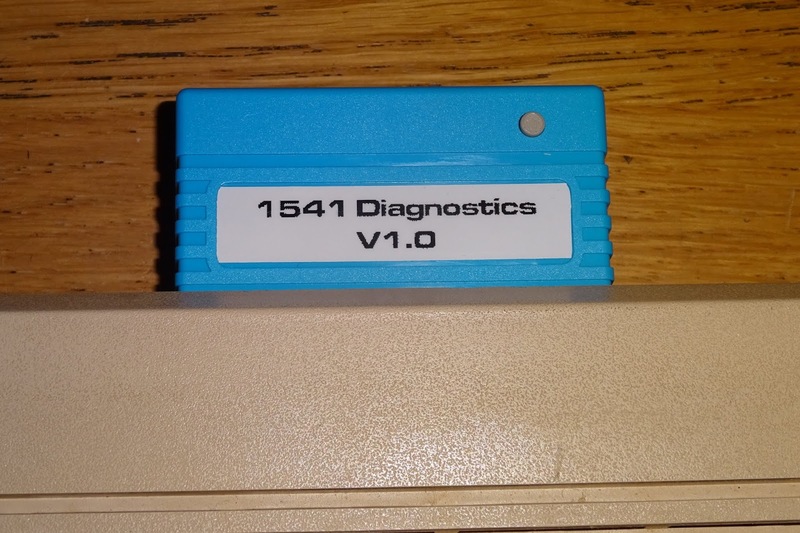 Some low profile ones may work, but not with glass windowed EPROMs. 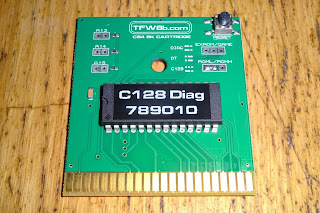 I have one built up with sockets and jumpers, and run this in the lower half of a cartridge case for situations where I want to test ROMs or change jumpers. 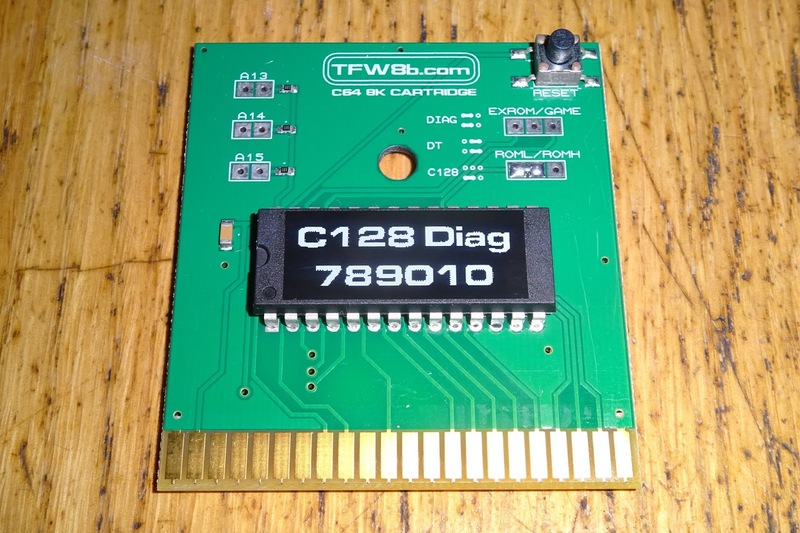 The boards are available separately, or with a cartridge case from my Tindie store, or direct from TFW8b.